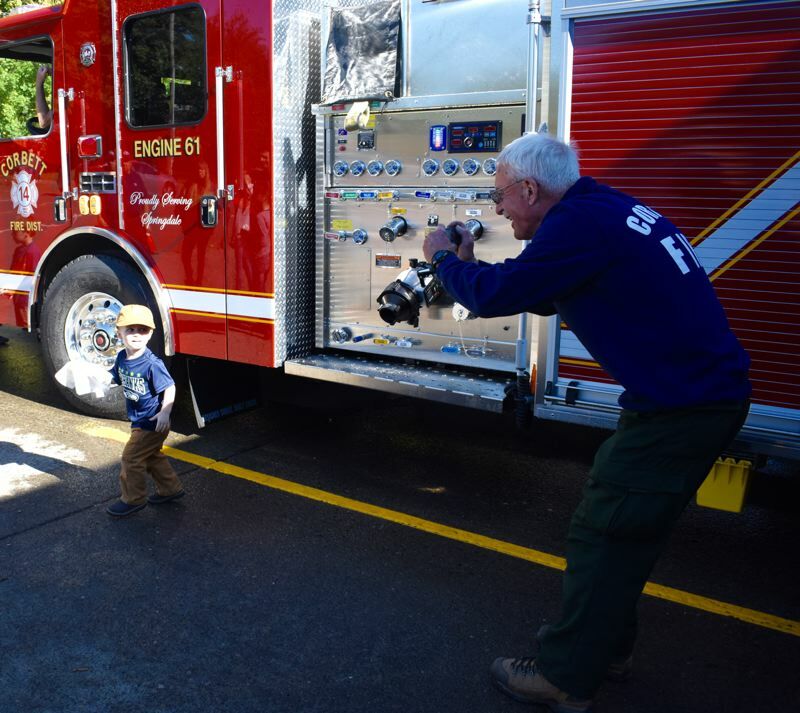 District hosts centturies-old 'wet down' ceremony during open house at fire station. 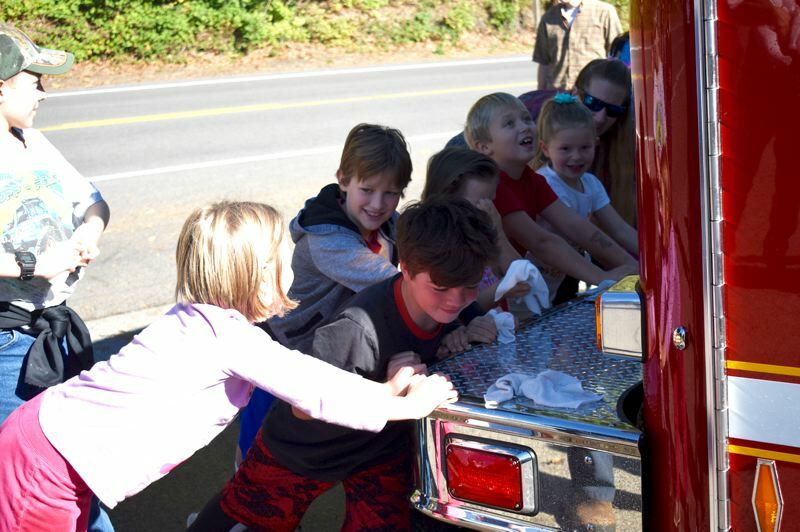 Children from the Corbett community washed a fire truck, and "pushed" it into service during a "wet-down" celebration on Saturday, Oct. 13, at Corbett Fire District's open house. Corbett Volunteer Firefighter Dennis Bryson led the ceremony and explained the history of the event. A "wet-down" is a fire service tradition dating back to the 1800s when community members would welcome a new fire engine by spraying it with water. The tradition began when horse-drawn water pumpers were used to extinguish fires. Though not as utilitarian as in the past, the tradition of the wet-down continues. 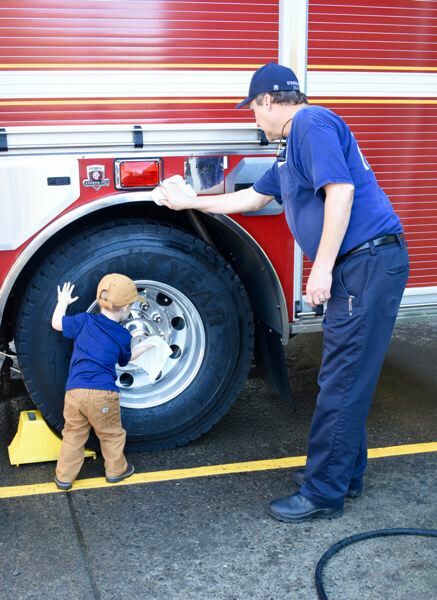 At the latest ceremony at the station, 36930 E. Historic Columbia River Highway, district personal handed out dry rags to kids, and asked the children to clean the engine to symbolically shine up the apparatus for the first time. One child was selected to spray down the engine before the kids scrubbed the truck. "Thank you guys for washing down our fire engine," Bryson said. Two-year-old Isaiah Warren celebrated by running around to help shine up the new fire truck, scrubbing as many areas as he could find — and reach. Once the truck was clean and ready for duty, children "pushed" the truck into the fire station. Actually, a firefighter from the district carefully reversed the engine a few feet while the children pushed from the front. In addition to the kids earning the pride of cleaning an important piece of equipment, Corbett firefighters also handed out plastic firefighter hats. Wyatt Slate, 11, also participated in the "wet-down" ceremony. In his downtime during the open house, he tossed a football and played lawn games with other kids around his age. "It's our first time coming, and it's a lot of fun," Wyatt said. "There's a lot to do."